Thank you for enquiring about our full immersion Yoga Teacher Training Level 2 (YTT) at the Krishna Village Centre for Yogic Studies. Making a commitment of time and money and most importantly a commitment to YOURSELF is a big decision. To help you make the right decision for yourself, we have collected the most common questions our previous teacher trainees have asked. Have a look through and feel free to get in contact about anything else that’s on your mind. Our graduates are happy to have a chat with you too, if you want to speak to someone who has already taken the journey. Namaste! Some 300hr YTTs are much shorter - why does this training run for five weeks? Many other courses are shorter, some as brief as 14-21 days. For those, the majority of the work for the 300hrs qualification is done remotely. We believe that this doesn’t give you the best chance at experiencing teaching in a supported environment, growing as a yogi over a period of time as you integrate the learning, and using the power of a group of like minded souls sharing the same journey with you. Our YTT is designed for a full immersion experience where you are living the complete yogic lifestyle, which involves far more than just asana postures. It includes practicing meditation and pranayama, understanding Ayurveda and nutrition, reading the classic texts of yogic masters, singing Kirtan and doing karma yoga work. All these practices are part of a holistic yoga experience and will benefit and inspire not only you but also your future students. What study hours will be required? During the course you will study 5 days a week for 7.5 hrs a day: 6.15am - 8.15am, then take a 1hr breakfast break, then study again from 9:15am-12.30pm, and then after lunch again from 1:30pm - 3pm. Then there are optional yoga classes from 5 – 6am, and 4.00 – 5.30pm that you will need to attend or teach a variety of, and a few evening sessions. In addition, we will be attending the Sacred Sound Retreat over the Easter weekend and immerse ourselves in Kirtan meditation along with about 1000 other participants. I'm not very flexible/bendy/slim/fit/young - will I be able to do your YTT? With all of the media and images of yoga out in the public domain, you’d be forgiven for thinking that yoga was only done by aspiring Victoria’s Secret models with a circus background. Yoga is literally for every body, and as one of the fastest growing pastimes globally, there are as wide a variety of students and teachers are there are bodies and people. To get the most out of the YTT we like you to have your own practice established, but you will ultimately do and teach the kind of yoga that suits you and your future students. You should have had a serious, dedicated, regular practice for at least one year before applying – ideally in a variety of different styles. All postures can be modified to suit a range of ability, and you will learn how to safely work with all body types – including your own. Many of the best yoga teachers have come to yoga to heal an injury, and understanding the frustration of physical limitations is a bonus for being able to teach empathetically. If you have the desire to be a yoga teacher, and the commitment to give the course your best, you will have an amazing and transformative experience, which is right for your body. Feel free to contact us if you have particular injuries or concerns that you want to discuss. What kind of experience do the teachers have who are leading the YTT? Lila Kirtana is an internationally experienced Hatha and Vinyasa yoga teacher with over a decade of teaching experience. Lila completed an Education degree at the University of Technology Sydney in 1998, and has been teaching yoga since 2005. 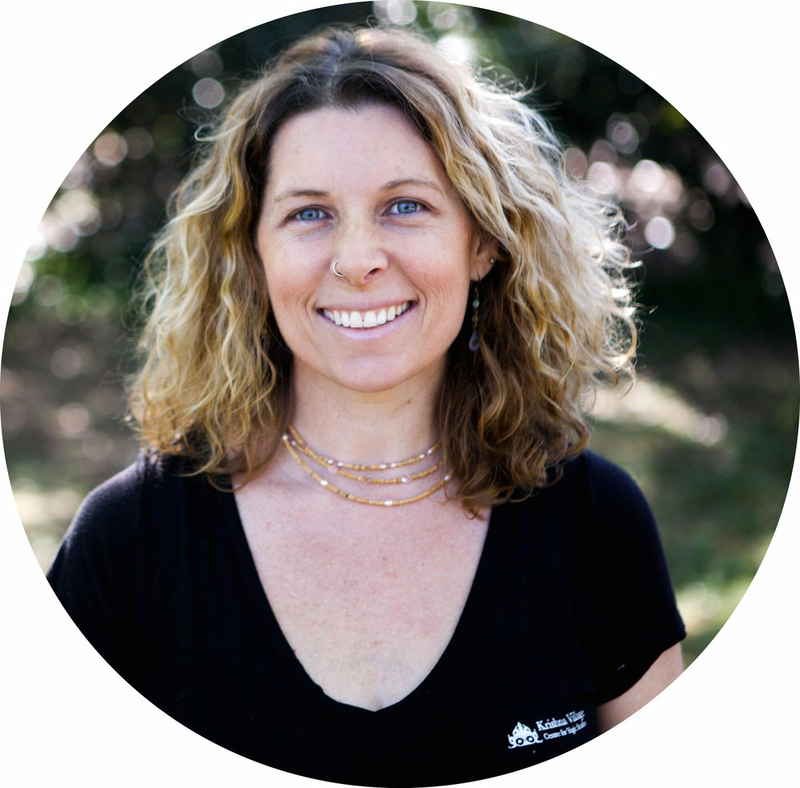 After spending 2.5 years deeply immersed in the yogic lifestyle as a volunteer in a yoga ashram, from 2008 onwards she has been working full time as a yoga teacher trainer in Byron Bay and Murwillumbah [Certificate IV in Yoga Teaching, RYT-500, Cert IV in Training and Assessment]. She completed Pre/Postnatal Yoga training with Bliss Baby Yoga in 2012, and was also is a regular presenter on their courses. 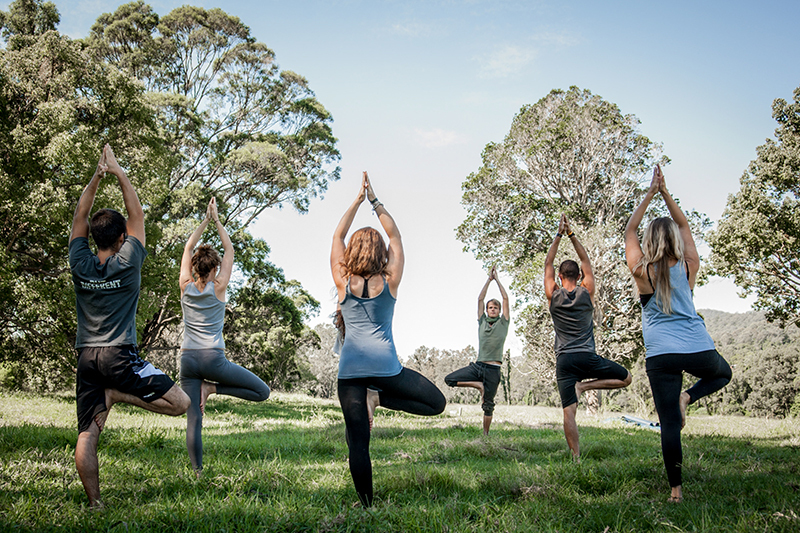 After becoming a mother, Lila completed a Kid's Yoga teacher training with Zenergy Yoga in 2014 and occasionally teaches Mum's and Bubs, Mum's and Toddlers and Kid's yoga classes in the Byron Shire. Recently she completed a Yin yoga training and is currently furthering her studies on how yoga can be used to help with Mental Health issues. She has been the senior trainer on the Yoga Teacher Trainings at Krishna Village since January 2016. Lila also holds a Diploma of Remedial Massage, is the lead singer of the enCHANTed band which holds regular kirtan evenings in the Byron Shire and at Yoga Festivals, and has a deep knowledge and understanding of Ayurveda through years of study and regular trips to India. Lila is a passionate Bhakti yogi inspired to share the things she loves through yoga teacher trainings. Michael Kubitzky began his yoga journey at the age of 20 when he left his profession as a studio musician and joined a bhakti yoga monastery. After over a decade of living as a monk, he took an interest in the more physical aspects of yoga. He successfully completed a 3-year diploma course with Satyananda Yoga before finally finding his passion with Power Vinyasa. Since then he’s been certified by Baron Baptiste, became certified with Anti Gravity level 2, founded one of Australia’s most successful regional yoga studios, and has helped pioneer, develop and facilitate many teacher training programs here in Australia. As a teacher trainer, Michael brings with him great integrity and depth, forged by more than 31 years of strict, yet joyful daily practice. His teaching is full of compassion, humour and authenticity, with a deep respect for tradition, but without being over zealous. Michael Olabode, our philosophy teacher, came across Bhakti-yoga in university and after graduating in Business from Cass Business School in London and landing a job in UBS international bank, he decided to explore the wisdom of yoga further. Having been to India 7 times over the past 5 years to study and explore the secrets of the Indian wisdom texts like Bhagavad-Gita, he was invited to teach philosophy and host interactive life seminars in universities and institutions in the UK, Belgium, Netherlands, Nigeria, India, Australia and New Zealand since 2010. Outside of teaching Michael enjoys travelling, cycling, playing football, volleyball, basketball, rapping, writing, advising, problem-solving and challenges anyone on earth at table tennis. How much teaching experience will I get over the length of the YTT? 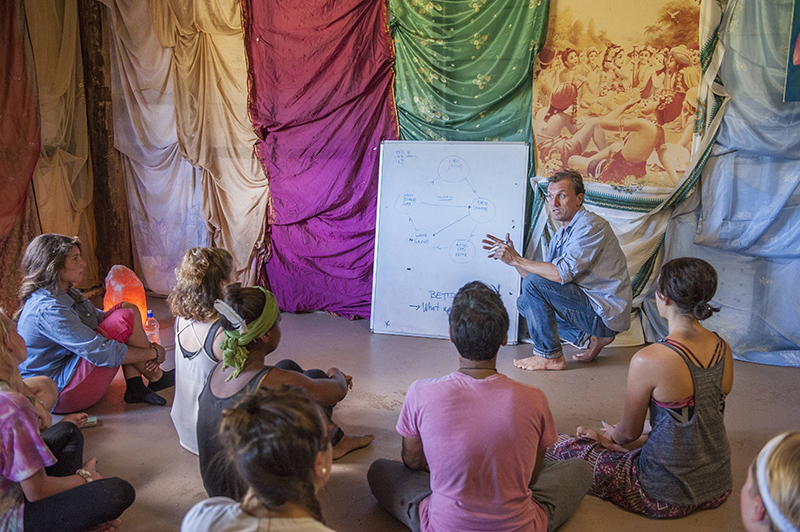 One of the unique features of the Krishna Village YTT is that you begin your teaching journey from Day 1 of the course. As a trainee, you will receive expert feedback and guidance to hone your unique teaching style. As Krishna Village runs two public yoga classes a day, the opportunity to teach a diverse range of people and skills over the 5 week period gives you a significant advantage over most other Yoga Teacher Training courses. Once you have completed the Krishna Village YTT you will have several additional hours of teaching under your belt, and be confident to share this new content in any studio or 1:1 situation. Will my accreditation be internationally recognised? The Krishna Village Centre for Yogic Studies 300hr YTT level 2 course is recognised by Yoga Alliance (YA) which is an international certifying body. Once you have finished the YTT you will be eligible upgrade your registration with Yoga Alliance to 500hr yoga teacher level (at your own cost) and will therefor be eligible for professional insurance etc. Will there be Karma Yoga work (seva)? On our level 1 YTT we include several Karma Yoga days to allow people to integrate their learning while contributing to the community. Karma Yoga (= seva, selfless service) is also an essential element of yogic practice. For the YTT level 2, however, we have decided to fully focus on learning and teaching, and not any seva hours. You are welcome to join us in the gardens or for milking the cows on your days off work. But Karma Yoga will not be an essential part of this training. The Krishna Village is part of the larger ISKCON community farm New Govardhana, which also includes a temple, two ashrams, a school and a cow protection program. As part of this spiritual Bhakti Yoga environment, we ask that you adhere to our Code of Conduct while you are here. This involves abstaining from alcohol, meat, tobacco and drugs, observing quiet times after 9pm, and dressing appropriately when up at the temple for meals. We ask all our guests to be tolerant and open-minded towards other spiritual paths and encourage everyone to pursue and deepen their own spirituality if that is part of their journey, but there is no requirement to have any religious or spiritual affiliation. The course content, however, is based around the traditional texts of yogic philosophy such as Patanjali’s Yoga Sutras and the Bhagavad Gita, which are core reading for all YTT certifications nationally. Our Yoga Teacher Trainee Andria is a Buddhist. Hear about her experience at the Krishna Village. How does the Krishna Village relate to the temple and the Hare Krishna philosophy? The Krishna Farm as a whole belongs to ISKCON, the International Society of Krishna Consciousness - a non for profit organisation that has the purpose of living and teaching Bhakti Yoga, a spiritual path of seeking union with the Divine through loving devotional service to the Divine and our fellow living beings. So the original purpose of the farm is to be a temple community. Hence, devotees going about their daily prayers will be a familiar sight when you come to the prasadam hall (the dining area) near the temple for your breakfasts and dinners. You might hear them sing Grace before eating, but it's completely up to you whether you'd like to join in or not. The only request we have of you is to follow our basic rules (e.g. vegetarian diet and no intoxication) and to dress modestly when coming to the prasadam hall to eat, as it is part of the temple compound. For details, please have a look at our Code of Conduct. The Krishna Village started off in 2011 as a volunteer project to help maintain the large organic gardens and grow veggies for the community. It is located about 500m from the temple area, on the same property. In 2013/14 we started to develop it into a retreat centre, which now has a big yoga hall, several massage rooms, a reading room, community area with pizza oven and camp fire, and offers a variety of daily yoga classes and talks. Here, we usually host about 50-75 retreat guests, yoga teacher trainees and volunteers. Within this beautiful setting, we are aiming to allow our guests to dip their little toe into our culture and experience a blue print of what life could look like if you lived it by spiritual principles. You can participate in a variety of elements (vegetarian diet, yoga, kirtan, japan bead meditation,...) and pick and choose which of those might have some relevance for your own life. At the Krishna Village, we teach a lifestyle that's in alignment with our philosophy, but purposefully limit the amount of Hare Krishna specific content, so that our guests can choose whether or not to participate. Our practice of kirtan (mantra singing) is a daily habit - for 10 minutes after the morning yoga (Hare Krishna mantra) and for 30 mins before our Yogic Living classes (a variety of beautiful mantras and bhajans in Sanskrit and English). If you are keen to delve deeper into the devotional side of things, you are most welcome to visit the temple. We will be happy to show you around and answer your questions. On Mondays at 11am we run a Weekly Welcome Tour for all new guests to introduce the farm, the history and our offers in much more detail, and answer any questions you might have. What kind of people come to the Krishna Village? 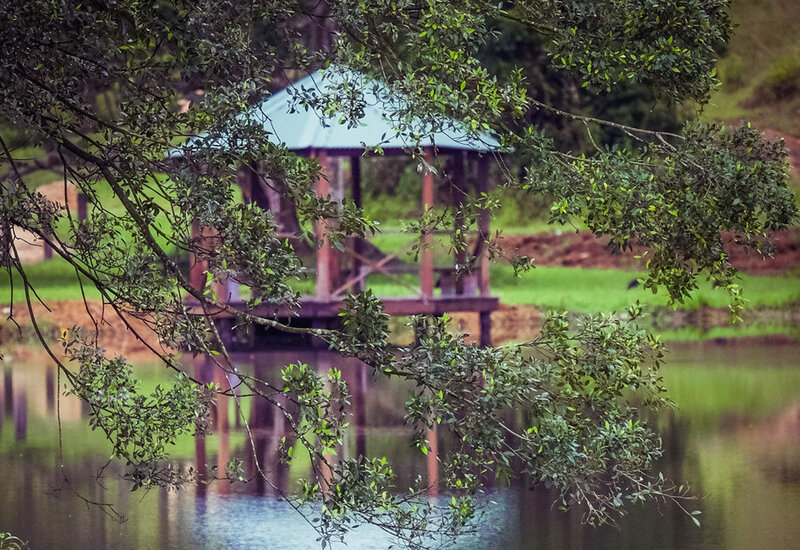 The Krishna Village is an eco yoga community and retreat centre with a vibrant and diverse community of travellers, locals and residents of all ages, who come looking for an inspiring yogic experience on a working organic farm within an established spiritual community. At any given time, we host about 50-75 visitors from all over the world: Retreat guests who take a week out of their busy lives to relax, do some yoga and gain a fresh perspective on life; you Yoga Teacher Trainees on your path to become fully fledged teachers; and a big bunch of Karma Yogis and full time volunteers – mostly backpackers who help us run the Krishna Village and our big organic gardens so we can share this wonderful space with you at really affordable rates. If you are expecting the same level of perfection that an expensive resort will be able deliver, this might not quite be your place. Our luxury is of a more transcendental nature: beautiful nature, genuine spiritual bhakti yoga culture and an open-minded, inspiring community. Do I have to be a vegetarian to participate? Krishna Village advocates the notion of ahimsa (non violence) as one of the key aspects of yogic living, seeing animals as beings with souls just like humans. Meat, fish and eggs are therefore not allowed onto the grounds of the Krishna Village or ashram, and while you are undertaking your YTT you will be supplied with 3 delicious vegetarian meals a day including a mostly-raw food lunch to support your healthy yogic lifestyle. It is your choice as to how you choose to eat outside of the YTT, however many yogis adopt vegetarianism as they progress in their commitment to yoga and begin to shift their awareness about their interconnectedness with the world. What’s the food like at Krishna Village? We follow a vegetarian diet, of mostly Indian-style food. As our retreat centre is catering for 100+ people most meals, they are unable to assist with any special diets such as vegan, gluten-free or sugar-free. We do our best, however, to always offer a variety of options. People with nut allergies are advised to self-cater. Breakfasts are an offering of porridge, kitchari [a dahl and rice stew with veggies], bread and butter, and fruit salad. Occasionally they have pancakes, and warm drinks like sweet chai. Most of the breakfast dishes are vegan. Lunch has a lot more raw food, and is all vegan and mostly gluten-free or will have a gluten-free substitute. We have different types of salads, coleslaw, and some vegie/lentil soup or stir-fries, and always smoothies and teas. In previous courses those people who were not able to eat very much raw food would bring their own container to take some kitchari at breakfast, or would cook their own lunch at the camp kitchen. Dinner is Indian-style, and almost always consists of rice, dahl, veg curries, fried bread, salad and desserts like halava [semolina], sweet rice, and sometimes cake. Quite often the curries have home-made paneer cheese, and may use sugar [mostly in the desserts]. Every 12 days we abstain from eating grains for an entire day [a special day called 'Ekadasi'], but otherwise we eat a very grain-based diet with lots of lentils, chickpeas, oats and rice. Self-catering is possible if required - in our camp kitchen is a large fridge where you can store food items, and cupboard space for dry goods. Best, bring a sturdy plastic box to store personal items. We usually offer small veggie boxes at our kitchen at an affordable rate, so you can cook your own meals, depending on what’s in season in our gardens at the time. Definitely bring some snacks, coffee & teas, and perhaps some cereal or breakfast things if you do not want to eat a cooked breakfast every day. We also make fresh juices and smoothies to order, from $12/ltr. Is there free time to relax? The Krishna Village YTT level 2 is structured to give you the right balance of practical learning, karma yoga and physical activities, structured and self study time and free time to explore the surrounds, head to the beach, or read a book in a hammock. You will need to prepare for the assessment tasks, which is factored in to your daily schedule. There is one full day off a week, at the least. One of the many benefits of an immersion course like ours is that you don’t have to do relentless 12 hour days and then work remotely without a break – instead, you can work at a steady pace with plenty of time and space to absorb and integrate your learnings. You can choose your own adventure when it comes to accommodation at the Krishna Village, from camping (or glamping) and powered sites for vans, to dorm accommodation (4-share) or twin-share and single rooms in one of our awesome converted shipping container residences. Prices and availability vary (first in, best dressed! ), with early bird discounts applying. Shared toilet and bathroom facilities service all guests, plus laundry facilities and a newly renovated well-stocked community kitchen with campfire and pizza oven. You can eat at the temple and enjoy our raw food offerings, or pick organic vegies from the garden and cook your own food. I'm a traveller and my English skills are pretty basic - can I still participate? To get the most out of this course you need a reasonable command of English, such that you can clearly instruct a class of beginners in English so it is safe and understandable, read complex text in English and hold philosophical conversations and discussions. If this sounds like it might be above your capacity feel free to discuss with us. How can I receive mail? For letters, there is an “inbox” (literally) at the entry of the temple shop where you can find the letters that have arrived over the last few weeks. If you are expecting a parcel, please look out for an Australian Post notification card – you will have to pick up your parcel at the Murwillumbah Post office once it has arrived. If you give this address to companies (like mobile phone provider, immigration etc. ), please remember to notify them of your new address when you leave – we can’t send your mail after you. Is there any additional cost involved? Pretty much all cost is covered with the YTT fee: accommodation, food, and the training. But a few extras arise that you’ll have to cover once you are here. Book pack: Our training manual + books will be provided at an additional cost of max. $50. Yoga shirt with the Krishna Village logo printed on to teach our retreat guests: BYO your own shirt (has to be unused!!) or buy our sustainable bamboo shirts from $24ea. We will cover the cost for one print. If you would like to get additional shirts printed, it’s an additional $5 per shirt. If you already have one of our shirts from a previous course, please bring it along.